Purchase At: Dreamspinner Press, amazon.com -To come. Zachary Blaise is having a weird week, even by his standards. Though he’s gay, the radio personality has somehow been dumped via text by a girl named Marian that he’s never even met. On top of that, he’s developed a massive crush on Marcus, the new waiter at his favorite diner, which his best friend thinks is hilarious. Impossibly, things are about to get even weirder. Marian has secrets, and those secrets are going to make some serious ripples in Zach’s life. When Marian and Marcus turn out to be the same person, Zach stumbles down a rabbit hole of abusive ex-boyfriends, psychotic relatives, and revelations from his own past. If he can survive the chaos, the journey might prove worth the effort. 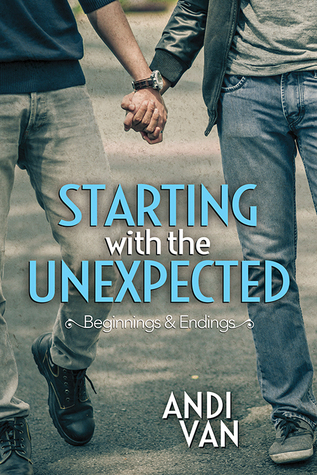 Starting with the Unexpected was a really good read for me. The blurb was the first thing that drew me to this. It sounded interesting, and I wondered how the whole Marcus/Marian thing would work out and if it would be dragged out for way too long. And for that, I’m really glad, because it made it easier to root for the couple, Zachary and Marcus. The drama with Marcus’ ex and family was just… wow. I was hoping someone would be a little nicer than the younger sister. But nope. That didn’t happen. The only thing I’m happy about is the fact he didn’t forgive and forget, which was a bit of a worry for a while, I have to admit. They didn’t deserve Marcus at all. He’s such a nice, sweet guy and they seem like poison to me. I also question the sanity of his younger sister and mom. There were also some issues with Zachary and his brother, Brandon. The issues they had weren’t as crazy as the ones Marcus had with his family, so that was a plus. I was curious to see how it would work out with Zachary and Brandon. I wasn’t sure if I wanted them to work things out or not. I didn’t know if it could after everything that had happened. But I was really happy with the way things worked out between them. Zachary’s best friend Jordan and parents were awesome, especially the mom. I love that they were supportive, nice characters. Zachary and Marcus were so sweet together. I love that their relationship seemed very normal and they were there for each other and supported each other. They even fought and made up again! It all seemed very normal, which was good considering some of the other things going on in the book. It was nice to see them facing things together and growing as a couple. Overall, this was a really good, solid 4 star read. I loved Zachary and Marcus and I loved Zachary’s parents and Jordan. It was a nice read and definitely a book I would re-read again if I was in the mood for something sweet. An ARC of this book was provided by the author in exchange for a fair and honest review. Nice review, Trisha. I can tell you really enjoyed the book! I just love that cover! It’s enough to get me to buy it. Sounds interesting Trisha. And intriguing, with the Marcus/Marian twist. I love normalcy, and realness in characters too.